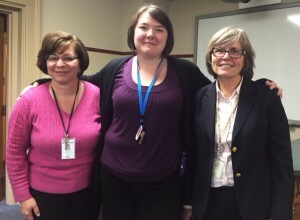 Northeast Regional Coordinator Paula Newcom, and I recently visited the Hartford City Public Library and met the new director, Michele Ogle. Michele gave a tour of the building, a Carnegie library that has been remodeled and modernized. Patrons in the library were engaged in genealogy research while others browsed the book resources. I asked Michele about her journey to her present position. It is a return to her roots having grown up in Montpelier, Indiana. As a child she regularly visited the Montpelier-Harrison Township Public Library and as a teenager worked as a circulation clerk at the library. She also worked there in the summers between college terms, before deciding to pursue her Masters in Library Science. Michele is excited about serving the population where she grew up. She finds it difficult to pick one favorite book but is partial to the Terry Pratchett’s Discworld series. Meeting non-famous people in history interests her, learning about how they lived and trials they faced. Other interests are playing videogames, gardening, all sorts of creative hobbies, and spending time with pets and her family. This entry was posted in Library Development Office, Professional Development Office (PDO) and tagged Hartford City Public Library, Indiana, Indiana State Library, Library, Library Development Office, Michele Ogle, Professional Development Office by indianastatelibrary. Bookmark the permalink.